Not to be confused with Oromia Zone. Oromia (spelled Oromiyaa in the Oromo language; Amharic: ኦሮሚያ) is one of the nine ethnically based regional states of Ethiopia, covering 286,612 square kilometers. It is bordered by the Somali Region to the east; the Amhara Region, the Afar Region and the Benishangul-Gumuz Region to the north; South Sudan, Gambela Region, and Southern Nations, Nationalities, and Peoples' Region to the west; and Kenya to the south. The 2011 census reported Oromia Region population is 35,000,000; making it the largest state in population. Oromia includes the former Arsi Province along with portions of the former Bale, Hararghe, Illubabor, Kaffa, Shewa and Sidamo provinces. 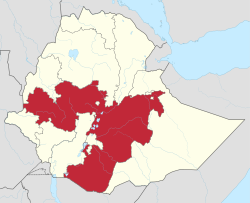 Towns in the region include Adama, Ambo, Asella, Badessa, Bale Robe, Bishoftu, Begi, Chiro, Dembidolo, Fiche, Gimbi, Goba, Haramaya, Jimma, Metu, Negele Boran, Moyale, Nekemte, Sebeta, Shashamane, and Waliso, among many others . Before 2000, the regional capital of Oromia was Addis Abeba (Finfinne in the Oromo language, which is also the capital of the country), on 10 June 2005, this was changed to Adama but sparked considerable controversy and this forced the government to bring back the capital to Addis Abeba. Critics of the move believed the Ethiopian government wished to de-emphasize 's location within Oromia.. On the other hand, the government maintained that Addis Abeba "has been found inconvenient from the point of view of developing the language, culture and history of the Oromo people." Oromia shares a boundary with almost every region of Ethiopia except for the Tigray Region. This boundary has been disputed with Oromia's neighbors in a number of cases, most notably between Oromia and the Somali Region. One attempt to resolve the dispute between the two regions was the October 2004 referendum held in about 420 kebeles in 12 woredas across five zones of the Somali Region. According to the official results of the referendum, about 80% of the disputed areas have fallen under Oromia administration, though there were allegations of voting irregularities in many of them. The results led over the following weeks to minorities in these kebeles being pressured to leave. In Oromya, estimates based on figures given by local woreda and kebele authorities suggest that 21,520 people have been displaced in border woredas, namely Mieso, Doba, and Erer in the Mirab and Misraq Hararghe Zones. Federal authorities believe that this number may be overstated by as much as 11,000. In Doba, the Ministry of Federal Affairs put the number of IDPs at 6,000. There are also more than 2,500 displaced persons in Mieso. In addition, there were reports of people being displaced in the border area of Moyale and Borena zones due to this conflict. On September 12, 2015 and continuing into 2016, protests broke out across Ethiopia and centered around the Oromia Region. Dozens of protesters were killed in the first days of the protests and internet service was cut in many parts of the region. Ethiopian Airlines Flight 302 crashed in the woreda (district) of Gimbichu on 10 March 2019. Based on the 2007 census conducted by the Central Statistical Agency of Ethiopia (CSA), Oromia Region has a total population of 26,993,933, consisting of 13,595,006 men and 13,398,927 women; urban inhabitants number 3,370,040 or 11.3% of the population. With an estimated area of 353,006.81 square kilometers, this region has an estimated population density of 76.93 people per square kilometer. For the entire region 5,590,530 households were counted, which results in an average for the region of 4.8 persons to a household, with urban households having on average 3.8 and rural households 5.0 people. The projected population for 2017 was 32,815,995. In the previous census, conducted in 1994, the region's population was reported to be 17,088,136; urban inhabitants number 621,210 or 14% of the population. According to the CSA, as of 2004[update], 32% of the population had access to safe drinking water, of whom 23.7% were rural inhabitants and 91.03% were urban. Values for other reported common indicators of the standard of living for Oromia as of 2005[update] include the following: 19.9% of the inhabitants fall into the lowest wealth quintile; adult literacy for men is 61.5% and for women 29.5%; and the regional infant mortality rate is 76 infant deaths per 1,000 live births, which is about the same as the nationwide average of 77; at least half of these deaths occurred in the infants' first month of life. Figures of full ethnic background are disputed, since many ethnically mixed Ethiopians are difficult to categorize. Particularly, Shewa Oromos and urban Oromos are known to have assimilated with ethnic Amhara and others, while southwestern Oromos have mixed with the Sidama and other ethnicities. The census and the general system of governance has remained controversial and related to the politics of the country. For instance, mixed Ethiopians with an Oromo father and Amhara mother are registered into the census using only their father's ethnic label. Similarly, Ethiopians with an Amhara father (or from another ethnic background) and Oromo mother are registered using only their father's ethnic label. Oromo (Afaan Oromoo), which is written with Latin characters, is the most commonly spoken language, spoken by 83.5% of the population. Other major languages are Amharic (11%) (especially in eastern Welega and northern Shewa), Gurage languages (Sebat Bet Gurage, Soddo, Silt'e), Hadiya, Gedeo (0.98%), especially in western and eastern Shewa; and Tigrigna (0.25%). Omotic languages are spoken by significant minorities in Jimma, Illubabor and western Welega; and some Nilo-Saharan languages (including Komo, Majang, Gumuz, and Berta) are spoken in communities scattered in the west. The CSA reported that for 2004–2005 115,083 tons of coffee were produced in Oromia, based on inspection records from the Ethiopian Coffee and Tea Authority. This represents 50.7% of the total production in Ethiopia. Farmers in the Region had an estimated total of 17,214,540 cattle (representing 44.4% of Ethiopia's total cattle), 6,905,370 sheep (39.6), 4,849,060 goats (37.4%), 959,710 horses (63.25%), 63,460 mules (43.1%), 278,440 asses (11.1%), 139,830 camels (30.6%), 11,637,070 poultry of all species (37.7%), and 2,513,790 beehives (57.73%). According to a March 2003 World Bank publication, the average rural household has 1.14 hectares of land compared to the national average of 1.01 hectares, 24% of the population is in non-farm related jobs compared to the national average of 25%. ^ "FDRE States: Basic Information, Oromia". The Federal Democratic Republic of Ethiopia. Archived from the original on 17 June 2008. Retrieved 29 May 2008. ^ a b Population Projection of Ethiopia for All Regions At Wereda Level from 2014 – 2018. Federal Democratic Republic of Ethiopia Central Statistical Agency. Retrieved 4 June 2018. ^ 2011 National Statistics Archived 30 March 2013 at the Wayback Machine (accessed 7 May 2012). ^ Hameso, Seyoum and Tilahun Ayanou Nebo (2000). "Ethiopia: A New Start?". The Sidama Concern. Retrieved 25 February 2006. ^ "Adama Selected as Oromiya's Capital". Walta Information Center. 13 July 2000. Archived from the original on 3 March 2006. Retrieved 25 February 2006. ^ "Honoring the Victims with Traditional Memorial Service". Ethiopian Airlines. 22 March 2019. Retrieved 31 March 2019. ^ "Households by sources of drinking water, safe water sources" (PDF). CSA Selected Basic Welfare Indicators. Archived from the original (PDF) on 18 November 2008. Retrieved 28 January 2009. ^ Macro International Inc. Ethiopia Atlas of Key Demographic and Health Indicators, 2005 (PDF). Calverton: Macro International, 2008. 2008. pp. 2, 3, 10. Retrieved 28 January 2009. ^ a b Census 2007 Tables: Oromia Region Archived 13 November 2011 at the Wayback Machine, Table 3.3. ^ "CSA 2005 National Statistics – Tables D.4 – D.7" (PDF). Archived from the original (PDF) on 18 November 2008. ^ Klaus Deininger; et al. "Tenure Security and Land Related Investment, WP-2991". Archived from the original on 10 March 2007. Retrieved 23 March 2006. ^ Cahoon, Ben. "Ethiopian Regional States". www.worldstatesmen.org. Retrieved 27 March 2018. Wikimedia Commons has media related to Oromia Region.